I have the great good fortune to be in a position where I can focus on something like producing this podcast. I genuinely enjoy doing it – look forward to working on it, in fact. It’s not made me any richer (yet), but after less than a year from launch, it at least covers its own costs along with a percentage of my beer budget. WAY more important for a baby-boomer like me, is that it’s a genuine vehicle for chasing self-actualization. When I say at the beginning of each episode that I’m continuing my quest to help you learn to have more fun than anyone else you know, I really mean it. I personally think I’m very good at having a good time, and it’s fun to share what I’ve learned about it. I’ve also just recently realized that one of the reasons I’m good at having fun is that I work at it. That got me to thinking about how anyone achieves any goal or reaches any level of success at anything – be that in life, a business career, personal relationships or having more fun than anyone else you know. I’ve actually thought quite a lot about achieving success over the years. And yes, so have a TON of other people. Some make a lot of sense, but most are blowhards, “wanna’ bes,” self-promoting charlatans. Hopefully the ideas I’ll share in this episode fall into the former category and will have some value to you. The first piece of good news is that each of us has a high degree of control over all three of the core factors – “secrets” if you will – of success. Intense – as in extreme and beyond what you think you can do. Daily – as in every day. Not just weekdays. Every day. That would be 7 days a week. Dedicated – as in that’s all you do. Everything else in your life gets excluded for the period of time you’re working. None of this multi-tasking nonsense. Deliberate – as in according to a formal, written-down plan. Not haphazard. Not seat-of-the-pants. Practice & Training – Yep… In addition to actually doing the work, you need to practice. Focus on each fundamental component of the work in question and rehearse. Measure your progress. For the training part, recruit a coach or coaches. You need some outside perspective to keep you honest! Continued Indefinitely – Jascha Heifetz, by many considered to be the greatest violinist of all time once said, “If I don’t practice one day, I know it; two days, the critics know it; three days, the public knows it.” In other words, even after you become the best in the world at something, you need to keep working to stay there. The only valid reason I can think of to not work hard is serious illness. If you’re healthy, get back to work. And can any of us have any excuse for not acquiring knowledge? It’s so easy! Every one of us has multiple devices that connect to the internet which contains essentially every bit of knowledge ever generated by the human race. And then there’s factor #3, dumb luck. Face it. Don’t get cocky. Don’t kid yourself. Don’t think too too highly of own amazing capabilities. Some level of your success is totally due to serendipity. Dig through any successful person’s history and you’ll find them accidentally and repeatedly stumbling into the right place at exactly the right time. I repeat… some amount of luck is a prerequisite of success. Don’t believe that? Think of it the opposite way. How many really smart, extremely hard-working people do you know that simply have never snagged the brass ring? Are we speaking of you perhaps? I repeat – if you don’t recognize the fact that you have accidentally and repeatedly stumbled into the right place at exactly the right time – you are insufferably arrogant. A jerk. Even though work and/or intelligence and/or luck will generate a steady stream of opportunities, we still need to reach out and grab them as they present themselves. Until we take an opportunity, intelligently work it and have a bit of good fortune, success will remain elusive. Grab the opportunities! They’re all around you all the time. 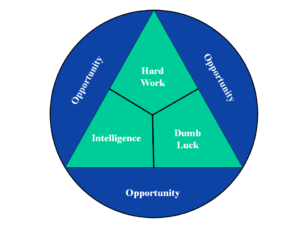 As I just mentioned, each of the BIG 3 – Work, Intelligence and Luck – increases the number of opportunities that come your way. On top of that, each of the BIG 3 also contributes to growth in volume of the other two. Work generates knowledge. Knowledge generates ideas that need to be worked. Exploiting a lucky break requires more work and new knowledge. You get the idea. The whole pie can get bigger. And the second bonus thought, the BIG 3 don’t need to be equally balanced – or even ever can or will be equally balanced. Sometimes Dumb Luck is the biggest factor. Sometimes it’s Hard Work. Sometimes it really is because you’re the smartest one in room. We have all seen all kinds of different combinations of the BIG3, and different combinations for the same person at different times. Luck alone or work alone or intellect alone will not get it done. Any combination of any two of the core factors won’t get it done either. So get out there, keep all three in mind all the time and have more fun than anyone else you know. Now get out there and implement your own vicarious. Do it now and post that IV Score!